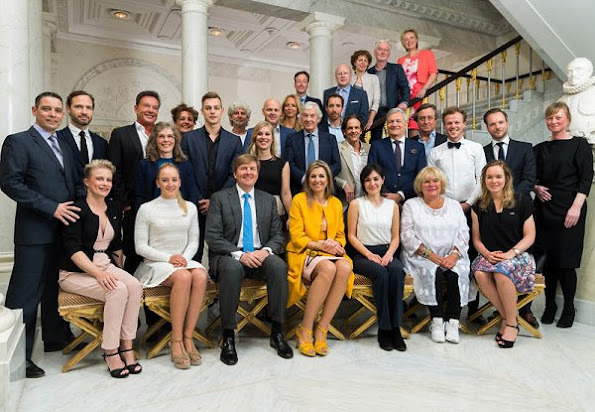 King Willem-Alexander and Queen Maxima held a lunch for 28 guests who have successful performances in various fields at Hague Noordeinde Palace on April 11, 2017, Tuesday. The guests consisted of award winner people having extraordinary performances in various fields like art, culture, media and journalism, science and sports. Another Look! At! Me! outfit combined with horrible hair. It becomes boring. Romana you are quite a mean person!! Maxima listen to us "Do something about your hair, its awful"! Looks a little bit like my lovely canary, but very sunny. Oh, the hair! How about a nice "Bob" now? The coat on its own is lovely when worn with neutrals, but with the yellow sandals in my opinion, too much yellow. I think yellow is a hard colour to wear too, as it can look very harsh. Susan you are attacking me personally, so if you want to see a mean person, just look at your mirror. 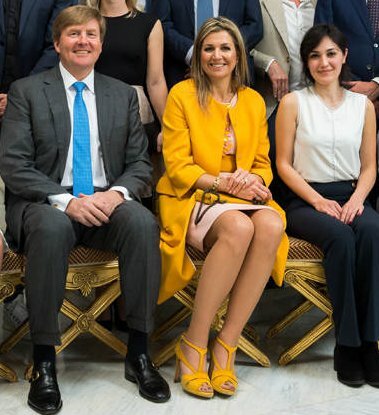 I was only criticizing Maxima's outfit, not her character. But nobody can deny that most of the time she dresses like an attention seeker. I think you are wonderful Romana! Ignore her. I did a few posts back. I wish you tons of yummy Easter eggs, dear Diane.